You can’t rise to the top without taking a few others down. If that means engaging in a workplace accidents, dodgy deals, and a shifty trick or two then so be it! You're going to need every trick in the book if you want to go from small-time slumlord to property tycoon! Mostly Positive (429) - 71% of the 429 user reviews for this game are positive. Hello everyone! How are we all? 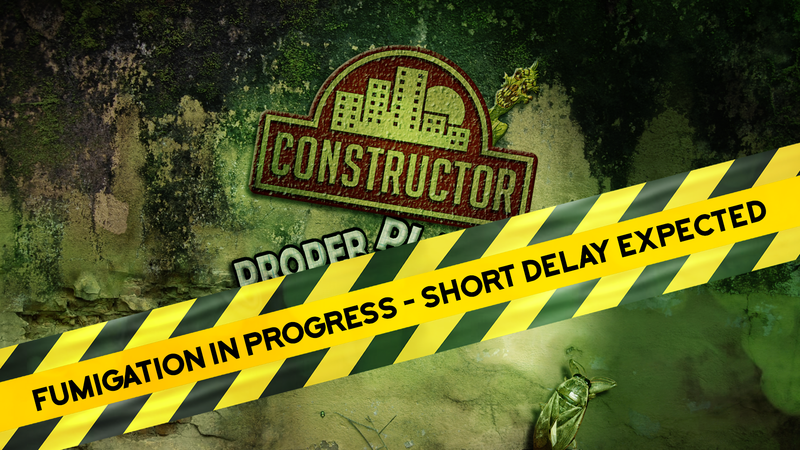 If you are interested in Constructor and still have not bought the game, why not hop, skip, and jump (or just click the links below) over to the Store Page? Down With That Sort Of Thing! But wait, that is not all! After careful consideration we have decided to remove Denuvo from Constructor at this stage, in order that fans who previously objected to Denuvo no longer have a reason to resist getting their foot in the door. If you have previously held off buying the game then why not hop over to the store page and give it a whirl? Coupled with the Autumn sale deals and a lovely weekend ahead. 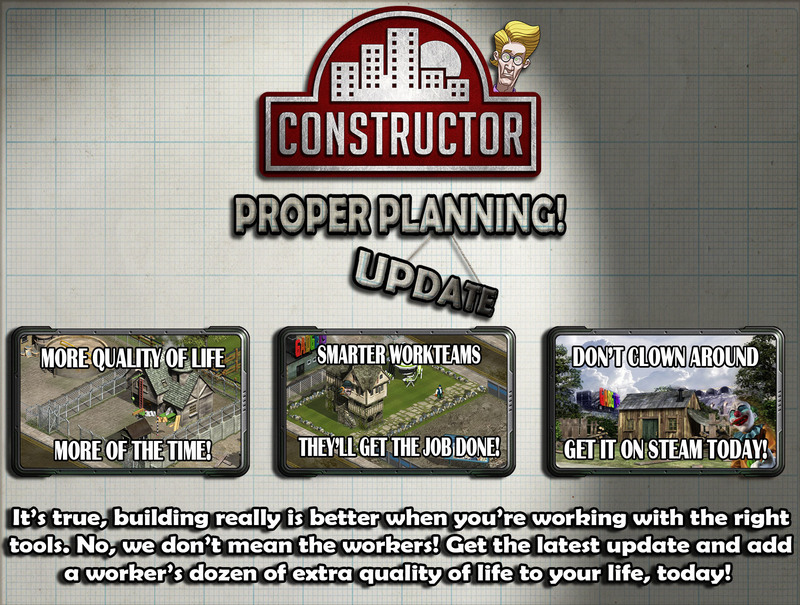 Well, a game or two of Constructor sounds pretty good to us! 1. Right-click Constructor in your Steam Library and click "Properties"
3. Look for the Steam Cloud section at the bottom of the window and click to disable the check-box if it is already checked by default. 4. You may now close the window and Constructor will not back up your saves to the cloud. In this update our main focus was to provide more quality of life improvements so that fans may play the game at their own pace. Critical to this goal was finding a way to give back some of the control of the game to player, especially in cases where people may find that the game gets ahead of them very quickly. Therefore, our biggest change was to completely overhaul how the pause system worked. If you recall the previous pause system, we allowed for some but not all actions. Unfortunately, this had the potential issue of overloading the buffer and so we had considered removing the ability to give orders in pause completely. However, doing this would only further overwhelm people who might have previously relied on the ability to pause, and that would not make for proper planning! We are very happy with how it works now, and we hope that anyone who might have found the game overwhelming at points will feel a little more in control of their game. Do not forget that if you wish to do so, you may rebind the pause button in the options menu to something more comfortable like the space bar. It is almost like tap 'n' go! Obviously, quality of life would not be complete without a few changes to how work teams function. Whilst we do not want to automate every function in the game, we can understand that some of the clicking becomes tedious. In this case, our decision was to automate how the work teams move between the inside and outside of a building depending on the work required. Previously, you would be required to call them inside a building to upgrade the rooms and either wait around whilst they're working or potentially lose precious time whilst they're waiting around inside for you to return. Not anymore. Once a house has been built you can schedule room upgrades, fence work, and have peace of mind knowing that when you return to them they will have completed both jobs without intervention. Additionally, if you have built a Gadget Factory you can queue up production and if there is a team available on the site they will move into the factory on their own, allowing you to get back to what matters most - sipping tea or your beverage of choice whilst your master plan comes together... something like that. Due to a change we made earlier this year, the Hippy's Street Party became quite effective against the AI such that all you needed was to have one Hippy and a moderately equipped Gangster and you'd be able to take out their HQ with minimal resistance. We liked how this felt on lower difficulties because it helps to ease players into the game a little more, but on higher difficulties it did not make very much sense. Therefore, the AI will be much more likely to respond to their HQ's SOS calls. Hand-in-hand with this change was also the decision to add a modifier for the HQ which reduces the damage that Gangsters deal against it by a moderate amount. This is an area that may be revisited periodically, but we do not want to make too drastic a change in just one update. We have also made a few more changes to its repair logic in order that it can better handle the rapid expansion that higher AI build speeds will bring. Do not worry, you can still change the AI's build speed in Gameplay Options, but we have also now raised the cap to 600%! Finally, blocking the AI's construction sites, especially of buildings it considers high-priority, will not be as effective as before. The AI will now attack and then attempt to chase intruders off the site, and for a small duration after that. This also includes attacking undesirables who, previously, could have just stood around the site and blocked it permanently. This is, of course, going to scale depending on the difficulty. Whilst the AI received a little help to enable it to adjust to some of the changes we had made to it, we are also extending that help to the players. We have added many new hints throughout the game that will provide advice on how to deal with certain situations such as Mr Fixit's flood, a property taken over by Ghosts, but also the functions of certain buildings themselves. There are quite a lot of them, but we have made sure that if you are a veteran of the game that you can disable them by toggling off hints in the Message Options menu. On the other hand, if you wish to see the hints after they have triggered for the third and final time, you may reset the hints in the same screen. Additionally, we have heard your feedback about easier difficulties not being quite so easy and our first pass to address this is to make a lot of hard-coded functions difficulty specific, and give you, the junior builder, a fighting chance. Combined with the new help messages and pause changes you should be well on your way to becoming a successful firm! You can find a full-list of what has been newly made difficulty specific below in the changelog. One effect in the game that we had not really used was the passive stress or happiness granting effect that buildings have on each other. In this update, whenever you place buildings that would affect the stress of tenants on that estate, you will see a floating happy face or sad face over each affected home. This also means factories now passively stress out tenants but, to off-set this in the early game, the HQ will provide happiness to houses on the estate. Additionally, lower levels of house will stress out higher levels of house by a small amount. This means that you can still place houses wherever you like, but the tenants next door may not appreciate living next to a shed. These effects will apply to rival tenants as well. Well that about wraps things up for the most important changes in this update, but as always you may find the full list of changes below. Please note that the list includes a few additions from the notes we posted on Friday! • Implemented option to restart the current game. • Implemented ability to change HUD animation speed. • Allow for continuous placement of the same property whilst shift is held allowing you to place multiple buildings of the same type without needing to go through the estate manager multiple times. • Workteams are now smarter and will automatically go between the inside and outside of a home to finish any room upgrades/fence that is in progress. • Workteams will now automatically enter a Gadget Factory if standing in the grounds, and there are currently gadgets waiting to be manufactured. • Added alert sound for "last conflict" notification. • Allow stepping through building lists using < and > keys. Useful to progress through tenant properties by one level at a time. • Players may now change the fences on Undesirable abodes depending on the type of undesirable. This will only be available if you have at least two choices of fence. The default fence will always be available regardless of whether you have unlocked it via the resources. • Players may now change the fence for their Headquarters. • Sheds placed in the grounds of a Gadget Factory provide additional storage for Gadgets (caps at four Sheds). • Sheds placed in the grounds of a Resource Yard provide additional storage for that particular resource (caps at four Sheds). • Added strength factor to fence display in UI - each star represents the number of hits one panel may take before being pulled down. • Save games can be confirmed using the mouse/controller on PC as opposed to just the keyboard. • Added toggle to invert mouse-wheel scrolling of the map. • New hint messages have been added to various areas of the game, and will trigger up to three times (not in the same game) after certain events. You may disable these by toggling "Hide Hints" in the Message Options. • Added View Previous Messages button to mission briefing display on subsequent visits. • Right-click on the time will now revert the game speed to normal speed if it was running at a faster speed. • Monuments such as the Liberty Statue, Washington Monument, and the System 3 Statue will provide a trickle of income based on how many tenants visit them. • Allow full control of game functions in pause mode. • Enable cloud synchronisation of saved games so that settings and saves are accessible across all user's machines. • Implemented relinking of opponent lists when loading a game if any were corrupted, to resolve certain crashes. • Fixed instance where messages for overcrowded prisons would be displayed if prisoners were dropped off at the Housing Authority building. • Fixed memory leak caused by continuous loading of SFX that were not loaded at boot, as a result of changes to the SFX routine for the Switch. • Fixed logic for repeating messages within 30 days so that it works as expected. • Fixed wrong image capture being used if save was cancelled the next time you try to save, or visit a screen which uses the last image taken as a background. • Corrected RMB functionality where it no longer allowed right-clicking the resource icons on the left-hand side to zoom to the relevant building. • Corrected RMB functionality which stopped right-click cancelling out of placing external gadgets. • Fixed characters remaining in frozen state if hypnotised by Clown whilst Clown's Arcade was destroyed. • Fixed instance where Mr Fixit being arrested as his ladder deployed conflicted with his arrested status. • Fixed Council Workers sometimes paving the wrong tile if they were interrupted during the tiling animation. • Fixed recoil animation for laser weapon not correctly resetting to character's default animation in certain situations. • Corrected character videos playing more than once for newly created characters when video mode "Once" was selected. • How often the AI creates its own repairmen • Improved Wood Yard's Tin Roof. • Dog Kennel no longer requires Brick Factory. • Implementada a opção de recomeçar o jogo atual. • Implementada a habilidade de mudar a velocidade de animação da HUD. • Agora é possível colocar a mesma propriedade novamente enquanto a tecla SHIFT estiver pressionada, evitando ter que abrir a tela de construções múltiplas vezes para selecionar a mesma propriedade para colocar e construir. • Times de trabalho são mais inteligentes e irão para dentro das propriedades ou mudar para o lado de fora, caso exista algum trabalho interno na casa para ser feito ou alguma construção de cerca a ser realizada. • Times de trabalho irão entrar numa fábrica de dispositivos automaticamente caso: estejam do lado de fora dela e existam dispositivos esperando para serem construídos. • Adicionado um alerta sonoro para a notificação de "último conflito". • Agora é possível circular pela lista de construções usando as teclas “<” e “>”. Útil para progredir através das casas em um nível por vez. • Os jogadores podem mudar a cerca das casas dos indesejáveis, dependendo do tipo de indesejável. Esta opção apenas será disponibilizada caso mais de um tipo de cerca esteja disponível. A cerca padrão estará sempre disponível independentemente do que o jogador liberou via recursos. • Os jogadores podem mudar a cerca de seu Quartel General. • Galpões pequenos colocados nos jardins de uma fábrica de dispositivos irão providenciar espaço extra para armazenamento de dispositivos (máximo de 4 galpões). • Galpões pequenos colocados nos jardins de um depósito de recursos irão providenciar espaço extra para armazenagem do recurso específico (máximo de 4 galpões). • Adicionado o fator de força para as cercas mostradas no UI - cada estrela representa o número de acertos que um painel precisa levar antes de cair. • Jogos salvos podem ser confirmados usando o mouse/controle no PC, ao contrário de apenas com o teclado. • Adicionada a opção para inverter o scroll da roda do mouse quando usada no mapa. • Novas mensagens com dicas foram adicionadas em diversas áreas do jogo, e irão se ativar até 3 vezes (não na mesma partida) depois de certos eventos. Você pode desabilitar estas mensagens na opção "Esconder Dicas" no menu de Mensagens. • Adicionado o botão de “Ver Mensagens Anteriores” nas instruções da missão em visitas subsequentes. • Clicar com o botão direito no tempo irá reverter a velocidade do jogo para o normal, caso o mesmo esteja em uma velocidade maior. • Monumentos, tais como a Estátua da Liberdade, Monumento de Washington e a Estátua da System 3 irão providenciar uma pequena renda baseada no número de visitas dos inquilinos. • Permitido o controle total das funções do jogo enquanto o mesmo estiver pausado. • Habilitada a sincronização na nuvem dos jogos salvos, desta forma todos os jogos salvos e opções do jogo serão acessíveis em todos os computadores dos usuários. • Implementada o religamento das listas dos oponentes quando um jogo for carregado caso alguma esteja corrompida, para resolver certos crashes. • Consertada a instância onde as mensagens de uma prisão cheia seriam mostradas caso um preso fosse solto na construção da Autoridade Habitacional. • Consertado o vazamento de memória causada pelo constante recarregamento de uma SFX que não foi carregada de forma correta durante o boot, como resultado das mudanças das rotinas do SFX para o Switch. • Consertada a lógica para repetição de mensagens de 30 em 30 dias, para que assim ela funcione de forma correta. • Consertada a falha na captura de imagens sendo usada caso um salvamento de jogo fosse cancelado, ou uma tela fosse visitada que use a última imagem salva como plano de fundo. • Corrigida a funcionalidade RMB onde não se permitia mais clicar com o botão direito do mouse nos ícones de recursos no lado esquerdo para dar zoom na estrutura referente. • Corrigida a funcionalidade RMB que fazia parar a opção de cancelar a opção de colocar um dispositivo. • Consertada a instância onde os personagens ficavam congelados caso estivessem sob a hipnose do palhaço e o Fliperama do palhaço fosse destruído. • Consertada a referência dos trabalhadores do Conselho que pavimentavam um espaço errado caso sua animação de pavimentação fosse interrompida. • Consertado o recuo nas animações da arma Lazer não sendo propriamente resetadas para o padrão do personagem em certas situações. • Reparada a instância onde o Mr Fixit, caso fosse preso com sua escada sendo colocada, geraria um conflito com o seu estado de preso. • Corrigido o problema que fazia o video dos personagens recém-criados serem ativados mais de uma vez mesmo quando a opção de vídeo estivesse em "apenas uma vez". Hello everyone! How was your weekend? We know that today was meant to be when we updated everyone with the new Proper Planning! Update, but over the weekend we encountered a few critical bugs which we need to resolve. We've called in Mr Fixit and his crack team of fumigators who can surely only make things better... so fingers crossed. Humour aside, we expect the delay to be for a short while, but hopefully not too long as we know that some of the new quality of life changes to be introduced in this update will be quite helpful to those who wish to play the game at their own pace. IN THIS TOWN ANYTHING GOES. 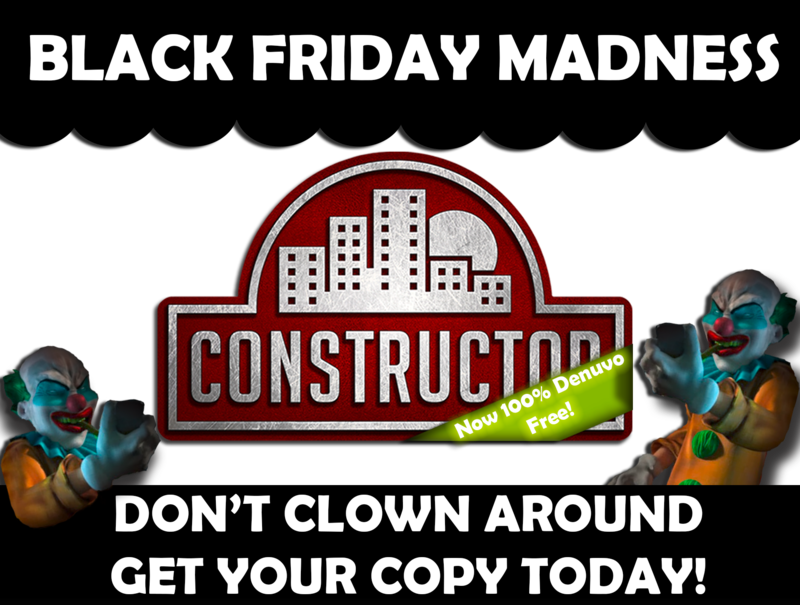 In Constructor, you take on the role of a budding property tycoon who must do battle with your competitors to create a thriving and profitable city...in ANY way you see fit! Build houses and factories, cope with the incessant demands of your tenants as well as keeping a whole bunch of UNDESIRABLE characters under control! This ‘colourful’ group of degenerates can also be used against the competition with humorous and catastrophic effect! After all, it's time you stopped playing by the rules and did things your way, and who knows you might even get away it, too! Have you ever looked at your rival's town and thought "That's quite a nice property you've got there. Mind if I take it?" Well, stop looking and send your trusty Foreman over to rip up the fence panels! Soon enough, you'll find yourself the proud owner of a previously used property - no deposit necessary! Sell it out from under your rival's nose for a quick profit or place your own tenant inside it for long-term gain. Of course, if you're not so interested in what the property can do for you but more about what it can do to your rival then simply let it fall into disrepair. Soon enough it'll become infested and eventually explode... hopefully taking out a few of your rival's men or properties with it! CRIME IS YOUR GREATEST TOOL. If all else fails, call in the Mob… Send your Gangsters around to take out your rival's most important properties, or hit their people to thin their ranks before you move in for the finishing blow. The more they kill the better the weapons your Gangsters will be able to access including but not limited to pistols and the devastating laser! A force to be reckoned with if ever there was one. Of course, if you've got cold feet and dealing with the Mob isn't your cup of tea you can also hire the services of various undesirables to do your bidding. Show your rival's just how much you really care by sending Mr Fixit over to provide 'assistance' with one of your rival's properties. If you'd prefer to just watch the carnage unfold send the happy-go-lucky chainsaw wielding Psycho over to carve up your rival's investments, and maybe just about anyone who tries to stop him! Just watch that whilst all this is happening that you don't forget about the latest nagging from the Council or it might just be closing time... for good! Just when you thought you'd earned yourself a tea break... Boom! The Council are on your back about some issue or another, and if you don't keep them happy you'll either lose some of your hard-earned investment properties or risk being closed down. Permanently. Keep them happy, though, and you'll be rewarded with special marks that can be sold for a quick cash injection, or as a way of staying in good with the Council as you proceed to ignore every one of your tenant's incessant demands. Treat your tenants well, though. In Constructor they're not only your most important form of income, you're going to need them if you want to breed additional children to one day join your workforce. This is especially true if you want to stay ahead because you'll need all of the help you can get to ensure that your factories continue churning out resources, gadgets, and of course industrial pollution. If you think you've got what it takes to be successful in the world of Constructor then put on your hard-hat and start digging. You've got tenants to please, rent to collect, and rivals to keep guessing. After all it's your town... so deal with it! TAKE A GANDER AT THESE FEATURES. An interactive tutorial guides you through the very basic concepts of Constructor from building your first properties to taking over your first properties. Six free play scenarios that test your ability from Financial Conquest all the way up to the perfect Utopian State. Keep things interesting by adding an opponent or three into the fray. Assist Nigel Plasterboard of Cobble & Stones across six multi-staged story missions. Why did Nigel abandon you during the tutorial? Who is Vincenzo? Are you even reading this? We'll never really know. Five different locations including lush countryside towns, an abandoned industrial sector, and a lush tropical jungle. The ever-present Council will keep you hard-pressed as it periodically harasses kindly asks you to complete various tasks based not only on your own progress, but that of your rival's as well. If your rival suddenly has an increase in active Hippy Communes then you can bet your most expensive property that you'll be hearing about it. Law enforcement helps you protect your investments from your rivals. If you're feeling a little more unlawful then consult with the Mob and create Gangsters of your own to deal with the problems directly. Populate your town with ten different tenants each with their own ridiculous demands and quirky personalities. From slovenly Slobs up to the snobby Sloanes you'll have no shortage of unfortunate residents to charge exorbitant rental fees! Getting tired of that one Major always complaining about a tree you planed in his garden? Kick him out and move in someone else who has a finer appreciation of garden apparel. Whatever that means. Six different Super Tenants each with their own function to help your town run just that little bit better. Keep them happy, though, because they tend to demand just a little extra attention than your average tenant. Seven wacky and completely undesirable... undesirables. Rob them blind with the Thief or blow them up with Mr Fixit. No job is too dirty for this lot. Well, unless it happens to be Mr Fixit bodging the plumbing, and spreading raw sewage all over someone's garden. Use your tenants to breed new members of your workforce. Look after your people by sending them to the hospital to keep them in peak physical condition. Decorate your town, and keep your tenants happy, with multiple garden decorations. Design and share city maps with online multiplayer battles against up to 3 of your mates. Constructor © 1997 – 2018 System 3 Software Ltd.
Made under license. Developed by System 3 Software Ltd. Published by System 3 Software Ltd.